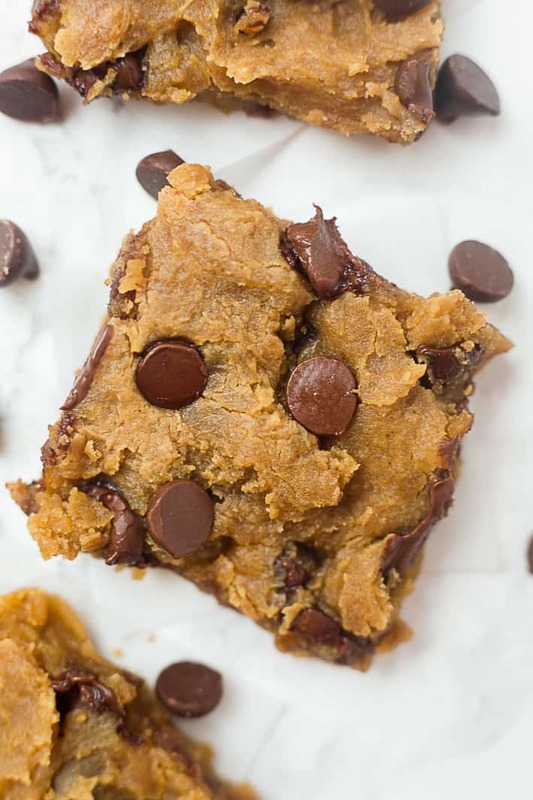 These peanut butter chickpea blondies are gooey, delicious, and made with no refined sugar. They’re nutritious enough to enjoy as a mid-afternoon snack and rich enough for an after-dinner dessert! And these healthy peanut butter blondies happen to be flourless, naturally gluten-free, and vegan, too. A couple of months ago, I joined my friend, Riley, for a mini staycation while she was housesitting for a family friend. We played with their dogs, went for a long run on the American Tobacco Trail nearby, taste-tested the 3 kinds of mint chocolate chip ice cream in their freezer (they were happy to share their food! ), shopped at the outlet mall, and had a fun staycation. Riley brought these peanut butter chickpea blondies to share and they were soo good. Like usual, I was a bit skeptical of any dessert that’s “healthy,” but I liked these enough to make them myself several more times, and I’ll keep making them in the future! The recipe Riley used was from Ambitious Kitchen, although I’ve seen chickpea blondies recipes floating around for a few years, so there are a bunch of similar ones out there! These peanut butter blondies do have chickpeas in them, but they don’t have a chickpea taste, fortunately. 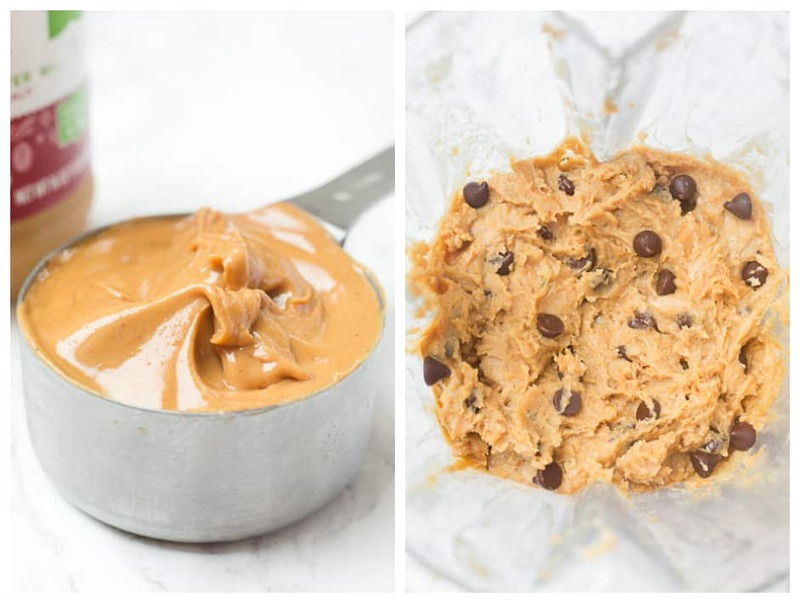 The ingredients (chickpeas, peanut butter, maple syrup) magically turn into a soft, gooey blondie. They’re good both hot out of the oven and later at room temperature or refrigerated. They don’t taste exactly like traditional blondies and are a bit softer, but I think they’re great for a healthy dessert. It’s just a bonus that these flourless blondies have nutrients like fiber, protein, and healthy fat from the peanut butter. You can make the blondie batter in either a food processor or a somewhat powerful blender. I actually made these twice to test how powerful the blender needs to be. The first time was in my parents’ Vitamix and that definitely did the job. The second time was with the much less expensive (but still pretty good) blender in my dorm room. I had to stop the less powerful blender to stir a few times, but it ended up doing the job. You definitely want the blondie batter to be smooth and mixed well! 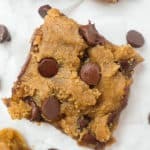 Since I love to bake and find it really relaxing, I’m always looking for new recipes to try, and it’s nice to have some healthier treat recipes in my arsenal. Most weeks, I make some kind of healthy baked good/snack like baked oatmeal or energy bites, in addition to making one or two main dish recipes for dinner. If you try these healthy peanut butter chickpea blondies, let me know in a comment or take a photo and tag me @livbane on Instagram! 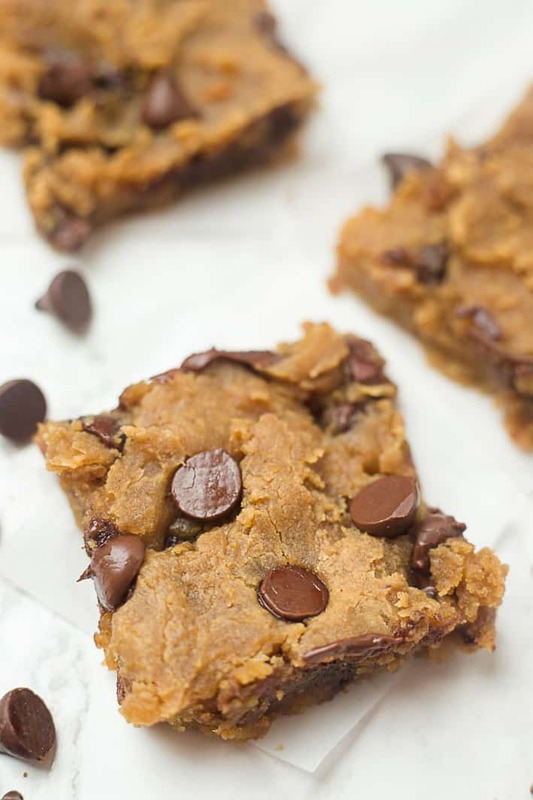 These peanut butter chickpea blondies are gooey, delicious, and made with no refined sugar. They're nutritious enough to enjoy as a mid-afternoon snack and rich enough for an after-dinner dessert! Add chickpeas, maple syrup, peanut butter, and vanilla to blender. Blend until smooth, and then add salt, baking powder, and baking soda, and blend again. Stir in chocolate chips. Line an 8x8 baking dish with parchment paper and spread cookie dough into an even layer. Sprinkle a few extra chocolate chips on top. Bake blondies at 350 degrees for 20-24 minutes, until top is just beginning to slightly brown or a toothpick inserted in the middle comes out mostly clean. 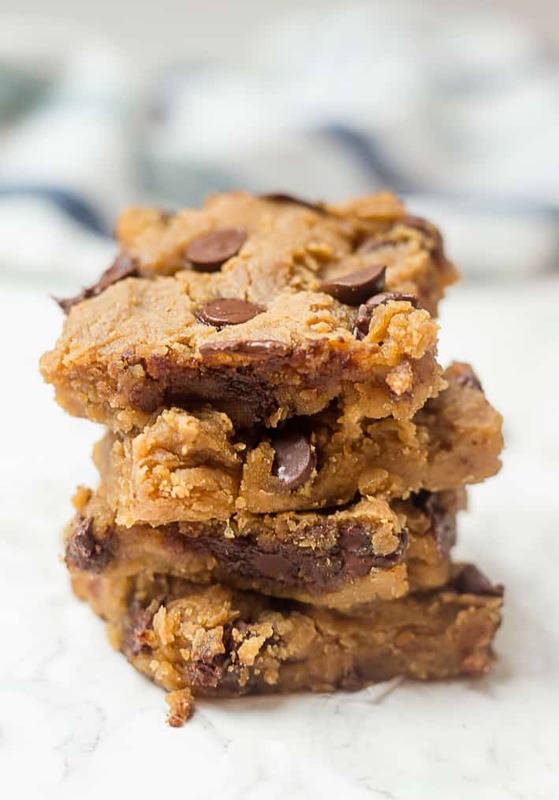 Although I think typical blondies taste great when they're super gooey, I personally find that you can taste the chickpeas if these are really gooey. So, slightly underbaked here is good, but not too gooey. Yes!! I love that trail and the fact that we went to school at the same place!! Go Heels!! I have never purchased chick peas, but if you can’t taste them in this recipe, I need to try it. Using dark chocolate, it sounds as though the brownies would be wholesome. I absolutely love stay cations. We had a little bit of that this month when my dad was gone in Africa. And I LOVE that you baked together. That’s one of my favorite bonding activities. These look insanely DELICIOUS and fudgy. Dropping by to say thank you for sharing this recipe. We tried making this last Saturday and it was delicious. The kids had a great time following the recipe. Just tried these tonight with using natural ground almond butter and unsweetened chocolate chips. Came out fantastic, although a tad salty, but I believe that’s from using unsweetened chocolate. I think I’ll cut the salt in half next time to compensate, but definitely on my desert rotation from now on! So glad to hear you enjoyed these and thanks for the tip about the unsweetened chocolate! I followed the recipe exactly and baked them according to directions. They came out much too gooey. There is such a thing as under baked. They are delicious but I think I will add ten more minutes to the baking time. Did anyone else have this problem? 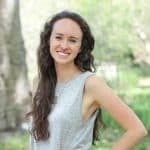 I am a long time reader, first time commenter. 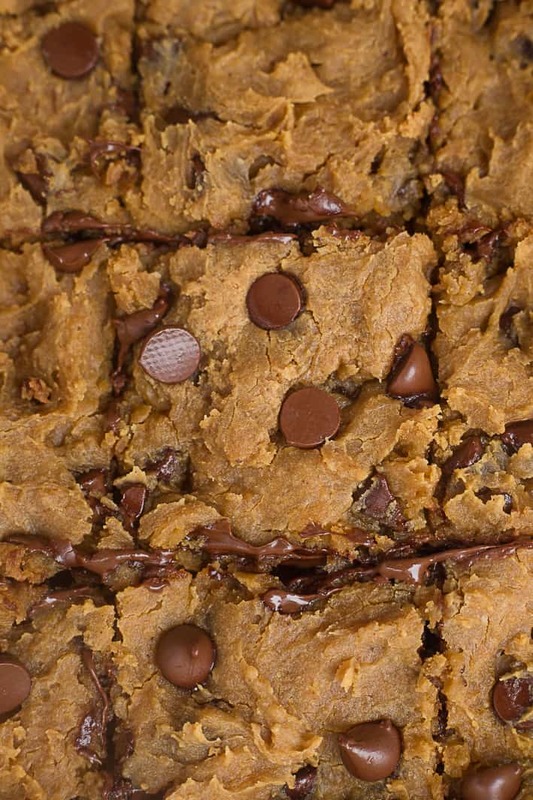 Your chickpea blondies look amazing. I will have to try them! They would also be good made into chocolate mint brownies – just add cocoa powder and a few drops of mint. I’m glad you enjoyed these! It sounds like they may need a bit longer in the oven (although they are a softer blondie in general)! Well I’m probably never making cookies or blondies the “real” way again! These were so delicious and easy! I didn’t tell my husband what was in them until after he finished one. He shrugged, got a glass of milk, and helped himself to another. I’m trying it with cocoa powder mixed into the batter right now to see if I can produce a healthy brownie, too! Haha! So happy to hear that you and your husband enjoyed these. How did they turn out with the cocoa powder added? I subbed in almond butter because I’m allergic to peanuts and added 2tbs cocoa powder to make them brownies. I also had to bake them for about 30 mins because the almond butter is runny but they came out really good! Still gooey. My brand new blender couldn’t blend the mixture as it was so thick. Had to add water. Made soups and pesto with the blender and worked beautifully. Maybe mine just cant handle the peanut butter?! Just made these with chopped pecans instead of chocolate chips (& only 1/4c maple syrup bc I ran out). SO GOOD!! I would even just eat a bowl of the dough. My kids loved them too. So glad you and your kids love these blondies, Jane!! Hey, Liv! How long do you think these will last if I store them in the fridge? Excited to try! Are these better with a Skippy/Jif brand peanut butter or will natural peanut butter work too? Hey Allison! I use natural peanut butter!